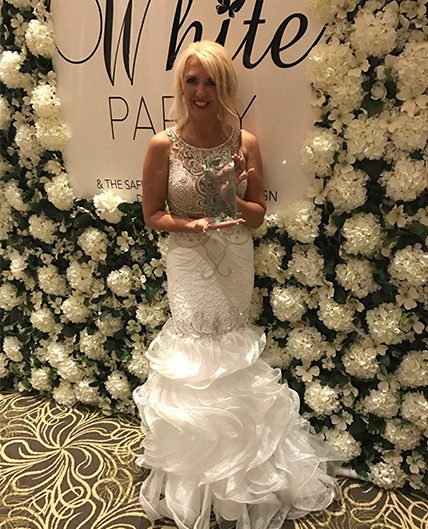 Renowned Brow Queen Karen Betts wins the ‘Outstanding Career Achievement’ award at the 2017 Safety in Beauty, Diamond Awards Event on the 8th of July. Karen dazzled in white as she gracefully accepted her award at the luxurious Langham Hotel in London on the 8th of July. The successful entrepreneur and previous winner of the ‘NatWest Woman of the Year Awards’ (2014) was once again recognised for her outstanding contribution to health, beauty and aesthetics. The Safety in Beauty Campaign works hard to help, advise and assist hundreds of customers when beauty & aesthetic treatments go wrong. Founded by KOL, presenter and writer Antonia Mariconda, the awards have been running since 2015 and were established to recognise the significant contributions made in the health, beauty, and aesthetics industry by brands, organisations, and professional individuals. Karen Betts is the UK’s most esteemed permanent cosmetics and microblading artist, and one of the earliest pioneers in the highly specialised art of paramedical tattooing. She is also the owner of the highly successful Nouveau Beauty Group of companies including the K.B Pro Permanent Cosmetics Training Academy which has successfully trains many students every year. As well as personally being trusted by numerous celebrities such as Gail Porter, Katie Piper and Amy Childs, the phenomenal Queen of Brows continues to dominate the industry of permanent cosmetics and treatments. With such an outstanding reputation, it’s easy to see why Karen was a natural choice for the award.